The N-Monthly pivots are calculated from the high, low and close of the chosen N month session (monthly, bimonthly, quarterly, semiannual, annual). This information is available prior to the start of the current N month session and does not change throughout its course. The technique has been around for decades, and because of its simplicity and efficiency, it is still in use today. The N-Monthly Pivots display GLOBEX (ETH) pivots, calculated from the high, low and close of the past month’s full session. 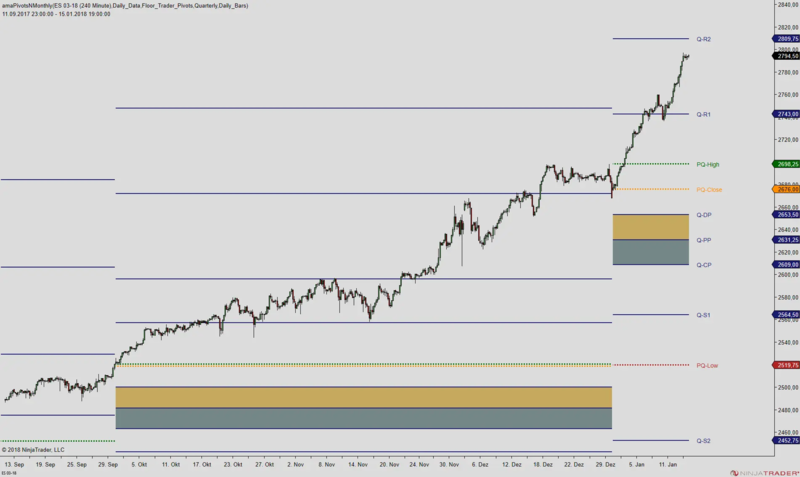 The calculation can be used to create current bi-monthly, quarterly, bi-annual and yearly pivot levels. If you want to display floor pivots (high, low and close of the past N-month’s regular session), please refer to the premium version. The indicator should only be used with trading times that reflect the contractual settings of the instruments. In the event that your data provider supplies the settlement price for futures, the indicators have an option to use the settlement price instead of the regular close. The N-Monthly Pivot indicator is used to display the main pivot as well as the central pivot and directional pivot, in addition to 4 major support and resistance levels. The indicator also comes with an option to display mid-levels pivots. Furthermore, you may choose between four (4) different formulas, namely Floor Pivots, Wide Pivots, Jackson Zones and Fibonacci Pivots.